LASER - Light Amplification by Stimulated Emission of Radiation - has been with us for a long time, and is found in all sorts of devices in our homes and workplaces. Laser therapy harnesses the photobiomodulating properties of laser light in the red and near-infrared wavelengths to promote various therapeutic effects including increased circulation, reduction of inflammation and pain, and enhanced tissue healing. Lasers are categorised according to five classes from 1-4. These classifications relate to their safety, with particular consideration given to their ability to cause damage to the retina if used inappropriately. Lasers in classes 1-3a are generally considered safe for eyes, whilst the risk increases with class 3b and 4 lasers. Therapeutic lasers may belong to either class 3b or class 4, and in either case both the therapist and the patient should wear eye protection. Used appropriately by a trained therapist with the proper safety equipment, therapeutic laser offers a safe mode of using light to stimulate tissue in order to promote therapeutic effects. Special consideration and precaution is taken when treating pregnant patients, patients with cancer, rapidly growing bones and joints of young patients and actively bleeding tissues. Laser therapy is a non-invasive modality which aids quicker recovery. It can be used to treat a large range of acute and chronic conditions. Laser therapy can be used on its own, or as a complement to other therapeutic modalities and is often used as part of pain management, rehabilitation, whether after injury or surgery, and wound healing. Laser therapy has been demonstrated to accelerate tissue repair and cell growth, reduce fibrous tissue formation, improve vascular activity, increase metabolic activity, stimulate immunity and promote improved nerve function. It also has anti-inflammatory and analgesic (anti-pain) effects meaning that it can provide an alternative to pharmaceutical drugs in the management of inflammation and pain in cases where their use may be contraindicated or undesirable. The length and frequency of treatment will depend on the condition being treated, whether it is acute or chronic, and the size and depth of the area to be treated. Whilst acute conditions may initially require daily treatment for a limited period, more chronic conditions may need treatments every couple of days to begin with, before decreasing to once every few weeks as the condition improves. Whilst some chronic conditions may resolve, others may require ongoing periodic treatments. 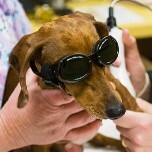 Laser therapy treatments have a cumulative effect. How will my pet feel after the treatment? During treatment your pet will feel little to no sensation, although occasionally a mild, soothing warmth or tingling may be experienced. After the first treatment you may see immediate improvement depending on the condition being treated, but often it takes a number of sessions before improvement is seen as laser therapy is cumulative in its effect. On rare occasions old injuries or pain may be aggravated briefly after treatment. In such instances the pain will reduce after a few days. In approximately 10% of cases there may be no response to treatment. Can Laser Therapy be used alongside other modalities? Yes! Although it can be used on its own, for many conditions it will be used as part of a multimodal approach and so it may be used alongside other forms of therapy including physical rehabilitation, acupuncture, chiropractic, massage, and hydrotherapy. Read more about pain management, physical rehabilitation, acupuncture and veterinary chiropractic.